The car park at the Supreme Court of Justice in Guanajuato had reached its maximum capacity. A solution to enlarge the parking area was needed. 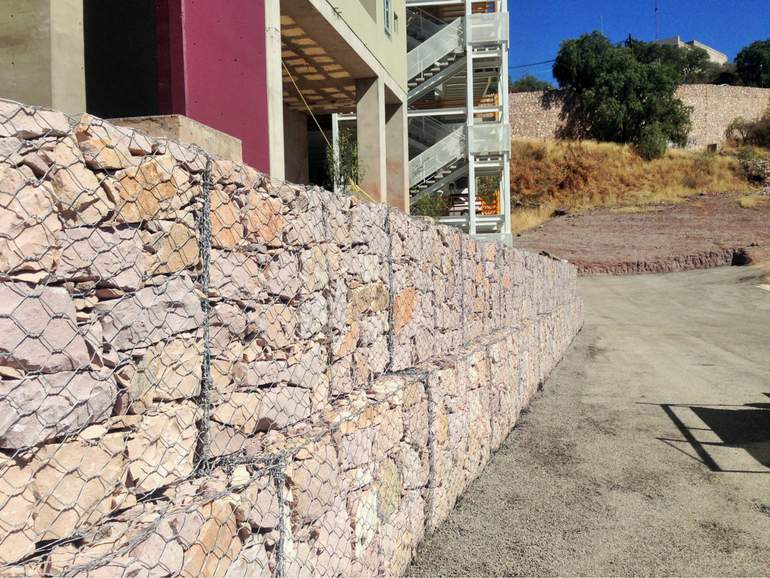 Our gabion mass gravity retaining wall was chosen because they are functional, aesthetically pleasing and cost-effective. The Supreme Court of Justice of Guanajuato needed additional parking spaces at their headquarters due to the large number of vehicles parking there on a daily basis. The rugged terrain surrounding the building made a retaining structure necessary to create a terrace on which to enlarge the existing car park. Selecting from our wide range of retention systems, we were able to define a unique solution to suit the client’s needs: a cost-effective retaining structure combining functionality with aesthetics. We proposed a mass gravity wall with gabions which allowed for the enlargement the parking lot and creation of 25 additional parking spaces. The system was also simple and quick to install. The project began in October and was successfully completed in December 2016. For more information about our mass gravity retaining wall solutions, contact us or click here to download our case history.